ouTube has over a billion users and is available in 76 different languages. So it’s easy to understand why it can sometimes feel that way. Community-contributed subtitles and CC - crowdsource your video subtitles and let your community help you reach more people in more languages. Opt-in by clicking here. Translated titles and descriptions - add translated titles and descriptions to your videos.That way fans can discover your videos in their native languages. We’ll display your video information in the right language to the right viewers. Translation marketplace (beta) - order professional translations of your content right from your Video Manager. Once you've chosen the target language(s) you prefer, simply checkout and pay. When the translation is complete, we'll auto-publish your content and send you a confirmation email. Some of our partners have already tested out these features and the impact has been pretty remarkable. Take VICE. Their channel more than doubled the daily watchtime on translated videos from Spanish and Portuguese speakers. In fact, watchtime from Spanish users tripled. ¡Impresionante! With the help of over 20,000 volunteer translators, TED, another important YouTube partner, has been experimenting with crowdsourced translations across thousands of videos in more than a hundred languages. 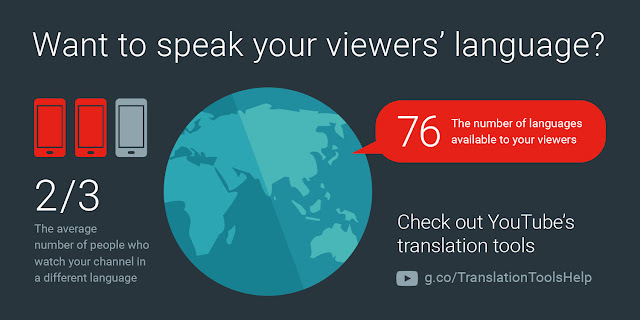 They joined the new translation tools pilot just a few months ago and for the first time combined translated captions with translated titles and descriptions for two thousand videos in 11 languages. They saw major growth in localized watchtime – the channel’s localized watchtime increased from 20% to 35% overall, and in several cases up to 60%. Ready to start using these features? Check out the translation tools overview page for more information! Do you ever feel like your videos are getting lost in translation? YouTube has over a billion users and is available in 76 different languages. So it’s easy to understand why it can sometimes feel that way. If we’ve learned anything in the past 10+ years at YouTube it’s that capturing and sharing videos is a great way to bring people there with you—whether “there” is an Icelandic glacier, a special performance by violinist Tim Fain, or just a friend’s birthday party. Virtual reality (VR) makes the experience of being there even more awesome and immersive, so today we’re bringing two new VR features to YouTube’s Android app. All you need is your current phone, and a Google Cardboard viewer. First, YouTube now supports VR video—a brand new kind of video that makes you feel like you’re actually there. Using the same tricks that we humans use to see the world, VR video gives you a sense of depth as you look around in every direction. Near things look near, far things look far. So if you were excited about 360° videos, this is pretty freakin’ cool. To give it a try just find a VR video on YouTube—like the Hunger Games Experience or TOMS Shoes Giving Trip—tap the new Cardboard icon, drop your phone into your Cardboard viewer, and you’re off! If you’re a creator, you can also check out technologies like Jump to capture and share your own VR videos. Our second bit of news is for the universe of existing YouTube content. And that’s the fact that you can now watch any video using Google Cardboard, and experience a kind of virtual movie theater. Just select the new “Cardboard” option from the watch page menu, drop your phone into your viewer, and you’re done. You’ll now have the largest VR content library right at your fingertips. Both of today’s updates make it easier to be there. In some cases, really there there. So download the new YouTube app from Google Play, and get going. Kurt Wilms, Senior Product Manager, YouTube VR recently watched “Waves of Grace”, Sanjeev Verma, YouTube Product Manager, recently watched “LA Phil: The Orchestra VR Video Experience” and Husain Bengali, Product Manager, Jump recently watched “Apollo 11 moon landing. This story was originally posted on the official YouTube blog. Earlier this year, YouTube began supporting 360 degree video on YouTube. Today, we’re unveiling new virtual reality (VR) features on Android that enable you to see and be seen in a whole new way.